Activity parameter configuration functionality was combined into fewer blades to make the actions more efficient. 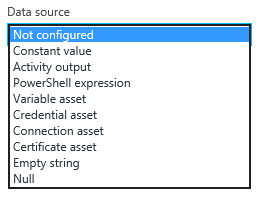 In activity parameter configuration, new data sources are available: variable, credential, connection, and certificate assets. This eliminates the need to use extra activities in the runbook to get these values. In the test pane, input parameter values are saved so that you can reuse them between tests. In the test pane, the test job status and any exceptions are shown in a separate window from the runbook output. When you define the input parameters for a runbook, you have two more types to select from: Int64 and Decimal. The activities and links in the canvas can be deleted by using a right-click context menu. We would love to hear your feedback and suggestions. Please tell us what you think in Azure User Voice. We’re listening!